Orchid Care The Flower - What Can You Learn? A Story of: Orchid Care the flower. The orchid flower is usually a thing of beauty. When diseases strike it can be tell - tale. Like the leaves, the orchid flower can tell you a great deal. Let's take a look at what we will learn. A sign of fungal infection or mold is pink or light brown spots on the flower. When you see either, caring for orchids will suggest to be careful with your other plants as the infection can spread to other plants. Remove the orchid flower or flowers that are affected. The remedy is to get more circulation. Yes, with orchid care the flower aphids can be an important pest as well as other sucking insects like Thrips or Mealybug and occassionaly scale. Orchid care the flower suggests that the remedy is spray the orchid with with some sort of a pesticide. I will initially use Safer soaps but if that does not do the trick I will move to a Bayer product that has Imidacloprid as an active ingredient. But but be careful and use a face mask and gloves when using any pesticide. Interested in learning more about caring for orchids from an e-book source? The real trick in caring for orchids is to gain some experience and education and to be preventive with respect to problems. It really doesn't take much time or knowledge to keep them healthy. Frequently people write me and ask me to recommend resources or sources of information to learn about orchids. Currently the one I am recommending first is Orchid Care Expert: A Practical Guide To Orchid Care by Nigel Howell. It is an excellent e-book. I own about 20 hard orchid books and over 5 orchid e-books. I like different books for different reasons. But this is the one I would suggest to start with right now whether you are a new orchid grower or have some experience. If you are interested in checking out Nigel's ebook further click on the "Click here" link below and it will take you to where you can learn more about it. 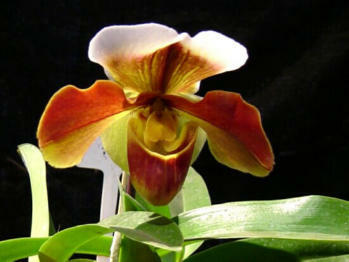 As we continue to learn more about orchid care let's learn about Orchid Care The Flower. With respect to flower color variation I suggest getting a second opinion from an orchid expert.Flower mottling or striation can come from breeding or a mutation. Or the cause could be a virus. If a virus is suspected then it is best to isolate the plant from other plants. If it is a virus some might recommend destroying the plant. However for a small collection or a non commercial grower this is not really necessary. The causes of bruising are many. It could simply be from mechanical injury. If this is the case the area of damage will not increase or go on to an other orchid flower. But it could also be from slugs or even cockroaches. You may need to investigate and use some thing to deal with them like dust or to bait them. If from cockroaches then diazinon or Sevin on the ground around the plant, on the plant and the pot as well. Caring for orchids also shows that the bruising on a orchids flower scan be from red aphids. If so, use the malathion treatment. The remedies are those that make sense, moderate the temperature changes and remove the affected flowers. Not sure what to do for the unknown attacker. the potential of a virus infection, (you see many of the flowers have the deformity). Need to isolate the plant. Caring for orchids does involve looking at the "whole plant". In caring for orchids the flower is important.